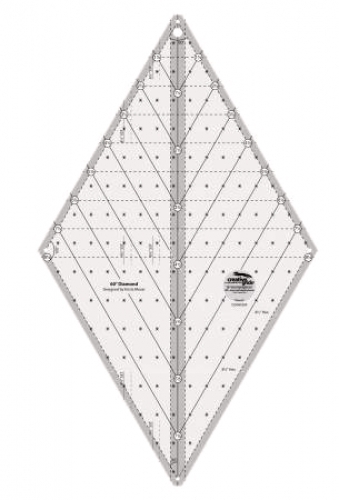 Increase your diamond design possibilities with the 60 degree Diamond Ruler. Cut 60 degree diamonds up to 8.5"; hexies up to 8.5"; and 60 degree triangles up to 8.5". Maximize the design potential by cutting them from strip sets. There are even markings included to cut 120 degree side setting triangles. The ruler slides easily over the fabric until pressure is applied. Then, our exclusive gripper holds the fabric in place while cutting, eliminating slipping and miss-cuts! It comes with fully illustrated step by step instructions or scan the QR Code printed on the instructions to view a video demonstration. with FREE SHIPPING click on the link. Click on this link for Cut Loose Patterns at $3.50 per pattern and Free Domestic Shipping.